Now Archived! PolarConnect event with teacher Rebecca Harris and researcher Ellie Broadman live from Kaktovik, Alaska on 24 August 2017. You can access this and other events on the PolarConnect Archives site. 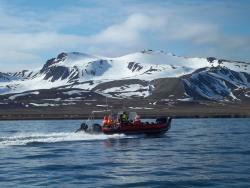 Lake Linné, Svalbard is the site of a previous year's research. Photo by Dan Frost. This project seeks to better understand the natural variability of hydrology and sediment transport in Arctic glacial lake systems, and to investigate how this variability might be impacted by climate change in the future. Studies such as this one, which captures natural variability across the Arctic at different temporal scales, are necessary to enhance our comprehension of how climate change has impacted and will continue to impact these systems. In order to improve our paleoclimate reconstructions of these processes, a crucial step is the development of a system model that describes the hydrology, sediment-flux, and sedimentation in glacial lake systems. A main goal of this project is to establish such a model, and to apply it to three glaciated watersheds that span a gradient from the sub-Arctic to high Arctic. The three lakes included in the study are Eklutna Lake (a sub-arctic lake near Anchorage, Alaska), Lake Peters (in the Arctic National Wildlife Refuge, Alaska), and Lake Linné (Svalbard, in the high Arctic). From 2015-2017, field seasons have focused on Lake Peters, where weather stations, sediment traps, ablation stakes, and various other climate monitoring has continued for a total of three years, and sediment cores have been collected to reconstruct paleoenvironmental changes. 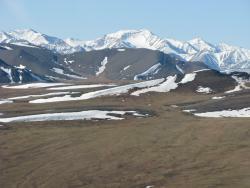 An aerial view of the Brooks Range. Photo by Melissa Barker. The G. William Holmes Research Station at Lake Peters (65 km south of the Arctic Ocean in the northeastern Brooks Range), is located in true wilderness. There are no man-made trails, and terrain is rugged and often steep. Brown bears, wolves, and wolverines are among the many types of animals in the area. Team members will be working long hours on a small boat on the lake, as well as hiking up 1000 vertical feet elevation to the nearby Chamberlain Glacier. How Much Sediment Can a Stream Carry? Teacher Rebecca Harris and Researcher Ellie Broadman discuss field work, weather and life at the remote field site near Lake Peters, Alaska as part of the Arctic Glacial Lakes Expedition. This live event was broadcast from Kaktovik, Alaska. Rebecca grew up in the outdoors, spending much of her childhood hiking, camping, and identifying birds and plants with her family. This exploration developed into an academic love for science, which led her to pursue a degree in Ecology from the University of California, Santa Barbara. Rebecca went on to earn her Masters studying plant community ecology at the University of Colorado, Boulder. While in graduate school, she was a NSF GK-12 Fellow and discovered that while she loved research, she was passionate about teaching and communicating science. Rebecca now teaches at a tiny school in rural Utah, where she learns from her students every day while teaching everything from 7th grade math to Biology. She teaches a field course for college students, is a volunteer EMT, and loves to explore the Grand Staircase-Escalante National Monument. Ellie is a graduate student at Northern Arizona University studying Paleoenvironmental Science in the Environmental Science and Policy program. Originally from Boston, she has happily spent most of her adult life studying earth and environmental science in California and Arizona, though her graduate research now brings her to Alaska to investigate Holocene climate variability. Ellie received her B.A. in Geography from UC Berkeley, where her interests in paleoecology and paleoclimatology were first sparked. Before attending graduate school, she worked as a Physical Science Technician for the Quaternary Paleoenvironmental Research Lab at the USGS in Menlo Park, California. It looks like you had a wonderful trip. So happy for you. I couldn't have put it better. I am definitely tired, but couldn't be happier. I still can't believe its over though! You do a really good job painting the daily scene with these audio journals. I feel like I'm listening to a seasoned outdoors writer.